One of our favorite guilty pleasures these days is following Kate Middleton on her way to the royal altar. We love her elegance and down-to-earth style and of course her pretty, fresh looks. Okay, so we like her prince, too. In honor of this pretty pair’s romance, our makeup artist, Kate (we love the coincidence), has created two Kate Middleton-inspired looks. 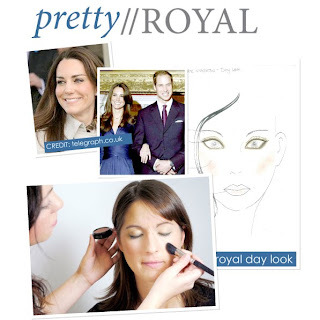 Check out the day look here and follow her steps to make this pretty royal look your own.